Candy Yeh’s Impeccably Curated Intersection of Business and Fashion | Gap Inc.
Like a GPS for fashion, Candy Yeh just knows how to get her customers, and their wardrobes, where they want to be. She constantly absorbs a deluge of trend information — from stores, from customer feedback, from Vogue, from Fashion Week — calculating and recalculating how INTERMIX remains her customer's ultimate style destination. When weekly store sales reports start flying into her inbox on Sunday night, Candy can't help but look before Monday hits. Which products had customers running to the cash wrap? Which ones were left on the store floor? And how are all of those numbers hinting at what Candy and her team should buy next? Say the numbers tell her shoppers are thirsty for a '70s vibe in the INTERMIX line. Perhaps Designer's Label, an under-the-radar Danish brand, has an amazing off-the-shoulder ruffle top — would they be willing to produce the same, but in different material, for a private-label look? 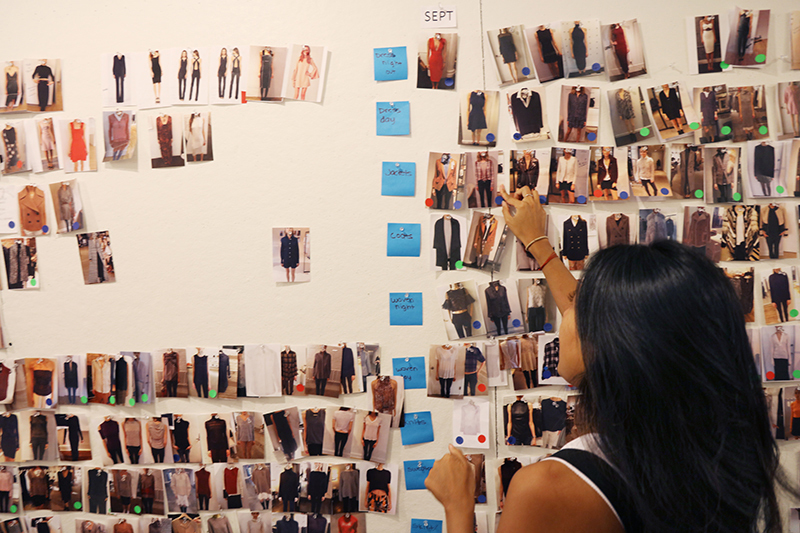 INTERMIX, a multi-label retailer, presents a unique challenge for the fashion buyer. Candy's craft marks the intersection of business, fashion and museum curator — maintaining and revamping a fetching collection of designer labels season after season, from store to store. So, the ruffle top? Not only did Candy know that INTERMIX customers would swoon for its groovy feel, she knew it would pair perfectly with the Rag & Bone skinny jeans she just got in store. And it's, not coincidentally, also a hit with the Aquazzura shoes hitting online. It's not just about stocking the stores with a certain top because that's what's in and selling big right now. It's about zooming out and knowing what's coming down the style pipeline. It's about telling a cohesive, compelling fashion story for the women who shop at INTERMIX — and encouraging them to tell that story outside of the store. While she is exceedingly approachable while effortlessly glam, Candy's daily outfits are as curated as her stores. She wears the labels of the designers she's meeting with, in a fashion-forward, seasonally appropriate way: a fall day in New York City called for an old denim dress under a Henley, for example. She's not technically a mind-reader, either; she's just that into it. And the signs came early that this was her path. Candy, as a kid growing up in Queens, knew she wanted to work in fashion thanks to the awe-inspiring Macy's Holiday windows. She turned that initial Miracle on 34th Street magic into a field of study at the Fashion Institute of Technology, which she credits with differentiating her passion for the clothes from her true passion for the business. While many might tip themselves toward one end of the scale — motivated more by fashion or business — it's essential, as a buyer, to be both. Sometimes, that means saying no to a look you really love. Take, for example, a recent visit with a well-known designer, who showed a black jacket that Candy (the fashion guru) loved. However, after reviewing what was selling in stores, and where there were opportunities for growth, Candy (the buyer) had to do what was right for the business. Separating yourself from the equation is no easy task when you're that invested and that practiced. Is a certain look from the runway too off the mark for the INTERMIX customer this year? Though x, y or z may have been the hottest look at Derek Lam's private show, how do we make a piece more INTERMIX? To answer those questions, Candy is constantly talking with the brands INTERMIX sells. When designers start taking appointments to show their lines, Candy fights to be the first in the door. When reviewing all of the looks — and sometimes even trying them on — she's always thinking of what the customer will think and what she knows is working in stores. “The stores are our eyes and ears to everything," Candy says. "Having that communication to stores is critical. They can tell us exactly why something working or not." So, if a particular product is selling really well, Candy works with the designers to incorporate more of those trends into the collection — think back to the origin story of that ruffle top. Each fashion decision goes back to the numbers from the stores and placing big bets on what customers have said they like. “I love the life cycle of it," Candy says. "I don't just love it because I like to shop for a living. I like to see how full circle it comes and how it resonates with our customers and what doesn't." That means that Candy is in the showrooms of designers, asking about all the details of a line. Not only is trend critical to a buy, so is the fit of a product. Once Candy is able to see, touch, feel or wear the piece, she can advocate for how it can be structured to best resonate with the INTERMIX customer. “We're fit maniacs here," Candy says. "Because a lot of the styles are exclusive to INTERMIX, they have to fit a certain way — if it's a little too boxy or little too long and hangs funky, it won't work. For new silhouettes, we always work with our brands to perfect the final fit of a garment. It's critical to our buys." “People have their thoughts on fashion, but at end of day, something inspires everyone as they get dressed," Candy said. “And if I can be a part of that in some small way, I think that's a beautiful thing." Read more about Six Jobs You Didn't Know Existed at Gap Inc.
Six Jobs You Didn't Know Existed at Gap Inc.